The core combination of ENC Designer, ENC Optimizer and 7Cs Analyzer provides all the software tools required to create a wide range of digital nautical chart products, including ENCs, IENCs, and AMLs. Further tools and plug-ins, such as the S-57 Writer plug-in for FME from Safe Software and ENC Referencer cover standard data import requirements. Other tools, such as ENC Bathymetry Plotter (bathymetric contours), ENC Cartographer (paper charts from digital data), ENC Encryptor and ENC Permit Generator (S-63 encryption and control) cover other key aspects of the chart production and distribution work flow. 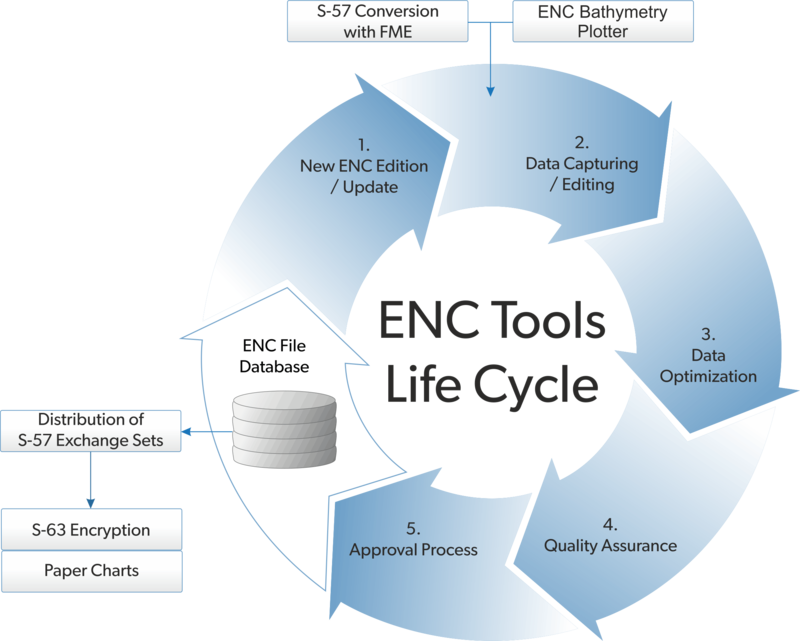 Overall, the SevenCs ENC Tools cover the complete ENC Life Cycle. Extremely cost effective, even for smaller, low volume chart production environments. Used by more than 30 hydrographic offices, port authorities and inland waterway authorities worldwide, the ease of use, flexibility and cost-effectiveness of the SevenCs ENC Tools make them ideally suited to low and medium volume chart production environments, especially where there is a specialist production requirement, such as AML or Port ENCs.